[By Nick, New for Early 2016] It's been a very long winter for me. Seriously, there haven't been many new products to speak of and we covered the majority of new 2015 products in the first half of the year. It made it seem like ages before I found something new or interesting. 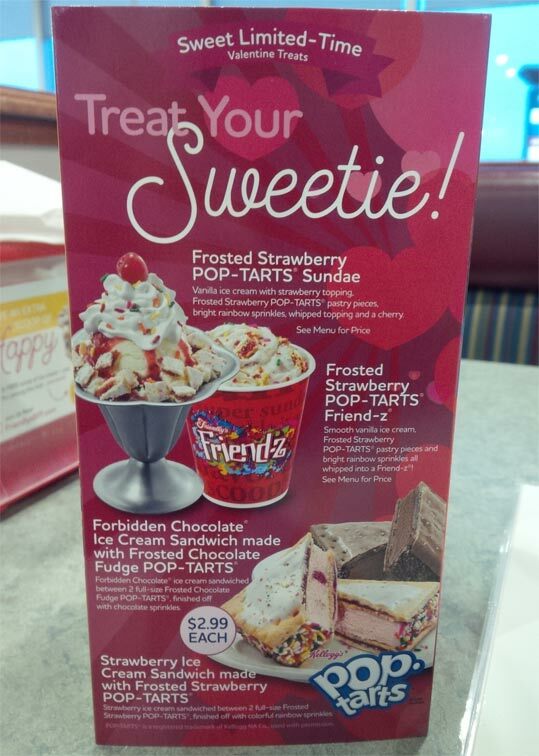 The lady and I found our way over to Friendly's last night and I noticed a few new Valentine's themed products. Don't ask me what pop-tarts have to do with love but let's not think too hard about it. 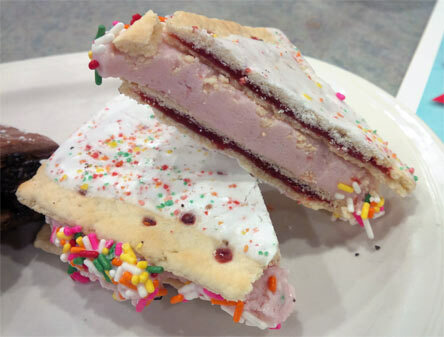 Remember when Carl's Jr/Hardees came out with the poptart ice cream sandwich? Or when Dubba and I perfected it? 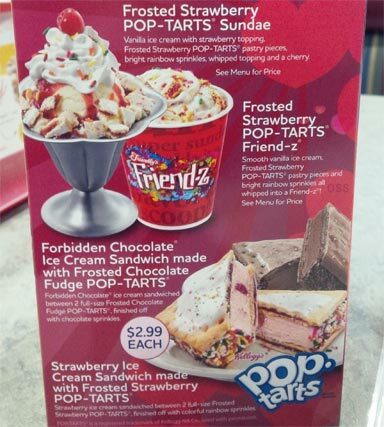 Yeah, Friendly's isn't reinventing the wheel here but hey, I give them credit for making two different sandwich options as well as a sundae and friend-z based on pop-tarts. While I was curious of the latter two, I knew I had to try the sandwiches. When I ordered them, the waitress made sure to let me know that they're 2 full sized pop-tarts to each sandwich. I guess I look like an ice cream lightweight or something. Whatever the case may be, I ordered both sandwiches with no shame. When they arrived at the table, I was a little disappointed. The pictures made it look like there was a good amount of ice cream but as we all know, food advertising is a lie. Let's go with the strawberry one first. Side note: I'm not sure if these are made to order or pre-made but I know that they're definitely cut by the employees. On both sandwich, one half was far bigger than the other. This might not be a dessert to split. I don't ever recall having Friendly's strawberry ice cream before and it's pretty decent. It has a nice, natural strawberry flavor with no iciness to it like other brands. It was a bit gummier than I'd like though. The pop-tart was fresh, well as fresh as a pop-tart can be. It was a bit chilled but that's to be expected. When taken as a whole, this is a pretty tasty and fun novelty. The strawberry flavors work well together and don't fight one another for dominance. The sprinkles are just there for a fun factor. Honestly, I found myself enjoying the sandwich a lot more than I thought I would. Is it perfect? No but it's a change of pace and a good addition to Friendly's menu. Let's talk about the chocolate now. The forbidden chocolate sold me on going with the sandwiches though. It just looked really appealing for some reason. It lived up to its looks in taste as well. Friendly's makes a great dark chocolate ice cream. Rich, creamy, chocolately, goodness right here. I have no problems with it minus it was also a bit gummy. The pop-tart was like the other one and easy to bite into without making a mess of myself. The chocolate sprinkles add a little more chocolate but not too much, they were more of a fun factor. This one is a lot more decadent than I thought possible from someone who wasn't me making it. 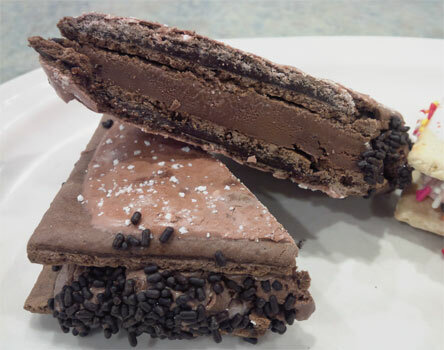 It was fudgy and a chocolate lover's dream come true. If you're debating about which one to try, I'd say the chocolate is by far the better one. Bravo, Friendly's. You're able to stay relevant in the ice cream world once again! I must know...Nick, had you read Dubba's recent Friendly's review and/or listened to Nosh Show 70 before writing this? Or are the comments about the "gumminess" of the ice cream independent? I am disappointed to hear that Friendly's is going downhill! Yeah that's the thing... very easy to make your own at home! Been doing that for a long time. Deb, completely independent. I've been a social media ghost of sort the past few months so I haven't done much reading or listening. Fran, it is easy but still nice to have someone else make it for you every once and awhile.